IT is hard to understand what Nelson Chamisa, Tendai Biti and Dewa Mavhinga thought they were doing flying to the United States to engage the Americans over the future of our own country. The agenda was politically disastrous, there was no strategy in the decision-making process preceding the fateful trip, and from the viewpoint of international relations the idea of going to engage the Americans in the way that happened is just naïve. The propaganda scoop for Zanu-PF was as predictable as Biti’s froth. Nelson Chamisa is an international relations practitioner, and he must have known before hand that a trip of this nature would attract a backlash, not only from social media and the public in general as happened, but also from political opponents, like those from Zanu-PF. Let me dare say here even top MDC-T officials were infuriated by the idea, and many other top officials from other opposition parties. Nelson Chamisa had the temerity to defend the treacherous trip whose clear sole purpose was to urge Americans to shun our efforts to rebuild Zimbabwe; to maintain the ruinous isolation of the country implemented through the ZDERA administered sanctions. In other words Chamisa went to the United States to shut up. Forget the law and political correctness. What was the point of going there? To cheerlead Tendai Biti and Dewa Mavhinga? I do not think so. 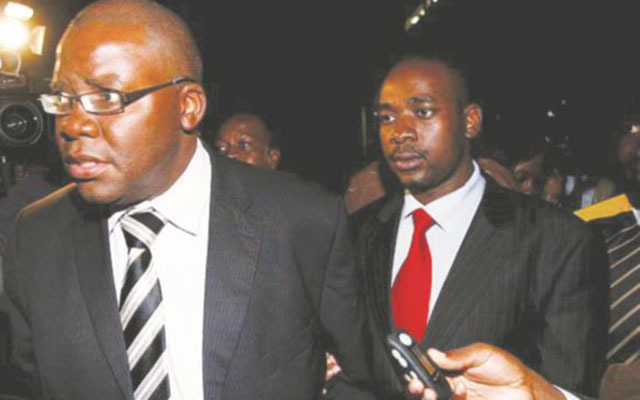 Chamisa wanted to stand in for Morgan Tsvangirai, and wanted to sell himself as the natural replacement for the spent force ailing opposition politician. The political ambitions of Nelson Chamisa always stand marvellous. Of course, Chamisa knows it is politically incorrect to urge the Americans to maintain sanctions on our country, so he would do not do the speaking. He had to leave it to Dewa Mavhinga who did the explicit begging; and to Tendai Biti for providing the cover for the treacherous trip. Biti said sweet nothings about legitimacy and other legal hullaballoo. Never mind the pontificating about the need for wonderful elections in 2018, and I would not bother attending to Nelson Chamisa’s bullet points on Election 2018. We have heard every word in those bullet points on a daily basis from way back in 1999 when the MDC was formed. Dewa Mavhinga is a systematic liar and a beggarly cheat: a poltroon and swindler who has committed every crime that does not require courage. The man is a daring coward of sorts, earning a living through small time cheap lies. He makes his living by pretending to be managing crises in the sub continent. From his days at Crisis International to his days now at Human Rights Watch, all Mavhinga knows is sensationalisation of little events so he can paint a picture of donor-attracting doom. Our military is “credibly implicated in rights violations,” and our military has taken over our politics. Essentially the three went to America to report our army as partisan, criminal, meddlesome, and also to say supporters of the opposition MDC-T needed protection from our military, if not from the Mnangagwa administration as a whole. Dewa’s call was to urge Americans to stay away from funding anything in Zimbabwe until “the country holds free, fair and credible elections.” Dewa’s idea of credibility is winner specific. To him Zanu-PF can only lose a credible election — never win. The existing US foreign policy on Zimbabwe is the ruinous illegal sanctions — illegal in the sense that at international law these sanctions have not been endorsed or supported by the UN. They are a bilateral showdown of power adopted by the US in 2001, and the sanctions remain in place as punishment to the people of Zimbabwe for failing to facilitate regime change in the country as desired by Washington. Douglas Mwonzora would want us to crucify Dewa Mavhinga and leave the other two robbers out of it. He suggests that Tendai Biti and Nelson Chamisa should not be crucified together with civil society because they do not represent civil society. Fair enough. But surely they walked together with the messenger of death, and they together with Mavhinga crucified our poor masses. Here are three men that connived to embark on a 13 000 km flight for the sole purpose of crucifying the nation so that Mnangagwa finds it hard, if not impossible to turn around the economy. It is very simple. There must be no goodwill towards the Mnangagwa administration so that there is no distinction between Mnangagwa and his predecessor. Poverty and economic decline must by definition define the two. Unemployment must remain, cholera must remain, suffering must increase, cash shortages must persist, and hunger must bite so Mnangagwa can be blamed. So Biti’s reasoning goes. We have an opposition that does not see itself winning an election because it has better sounding alternative policy. Instead our opposition is a protest movement that thrives on crises. People’s rights have to be violated, malnutrition must be killing thousands a week, health facilities must collapse, schools must fail to deliver education, soldiers must be rogue — and hell must rain its fires on Zimbabwe so our opposition can find something to point its finger at. Mnangagwa must be accused of being a serial human rights violator; he must be painted as the father of poverty, as a failure with no clue on how to turn around an economy like ours. I have no respect for politicians that believe Gukurahundi is a selling point to discredit Zanu-PF. Tendai Biti’s only burden with Gukurahundi is the political weight he believes the atrocity carries — it is the expediency that comes with Gukurahundi tears. I do not feel any mourning or sorrow in Biti’s Gukurahundi narrative, especially when he spares such narratives for American politicians. Tendai Biti goes to tell the Americans about the importance of acknowledging and apologising for historical atrocities. Yes, the Americans that have neither acknowledged nor apologised for the genocide on Amerindians. The Americans that have recently bombed and killed civilians without remorse in Afghanistan, Iraq and Libya. Like Dewa Mavhinga, Tendai Biti believes Gukurahundi, Operation Murambatsvina, Patrick Nabanyana and Itai Dzamara are convenient crises very useful to opposition politics. It is sad that we choose to politick and pontificate over past tragedies so we can bring down political opponents — with very little regard for justice for the victims. Tendai Biti did not go to Washington to seek justice for the victims of the tragedies he mentioned. He is a lawyer and he knows seeking justice for these people through a presentation to American politicians is nonsensical from a justice point of view – from the viewpoint of the law itself. Biti’s mission to Washington was not legal but political, and as such whoever maybe a victim of any kind of crisis becomes a tool in Biti’s box. Tendai Biti was hysterical about something he called “goodwill”. He was bragging that him and Chamisa were going to take this “goodwill” to the voters for Election 2018. He even claimed to have keys to Zimbabwe’s economic problems. Of course the keys he refers to are the donor funds the two excitable politicians were bragging about. Now there is only one goodwill that matters in the politics of Zimbabwe. That goodwill is not found in the Senate Houses in America. That goodwill is found in the hearts of Zimbabwean voters. If Tendai Biti believes donor goodwill is public policy then he is developmentally illiterate. No country was ever developed by the goodwill of international aid. Never. That simply does not happen. Aid is like a painkiller that temporarily relives pain without curing the disease, and Biti must have been told this somewhere in his sorry political life. The treacherous trio must be ashamed of their own names, must apologise to Zimbabweans for betraying the great hope prevailing in the nation today. I hear the US Embassy could have funded the trip. The problem lies in the funded puppets and their telling ignorance. There are no children, and there will never be a generation that will celebrate the isolation of Zimbabwe; let alone one advocated by our own politicians. This was a trip of shame. Nelson Chamisa you surely know better than this.